In 1822 a wooden chapel was constructed on the corner of Brisbane & Harrington St, near the present site of St Mary’s Cathedral. As far back as 1817 Father Flynn called at the settlement, on his voyage from England to Sydney, and administered the sacrament, and four years later Father Connolly arrived and commenced his work. He celebrated mass at Mr. Curr’s store in Argyle-street, and there the congregation consisted of nine persons. Services were subsequently held in the old building in Elizabeth-street, known to us in later years as “Rats’ Castle.” Father Connolly having obtained a grant of 14 acres of land at the angle of Harrington and Brisbane streets, called it Mount Carmel, and in February, 1822, a small wooden church was commenced. It was finished in the following year, and dedicated to God, under the invocation of St. Virgilius. Preceding this activity was the work of Father Connolly, accredited by the Colonial Office in 1820 to Van Diemen’s Land, where the Inadequate weatherboard chapel of St. Virgil which he was permitted to erect in 1822 functioned until 1836. It may not be generally known, that, adjoining the Roman Catholic Chapel in Hobart Town, a large site of ground has been given by Government as its burial-place.—Several persons have already been interred there; among whom was Private Thomson, of the 40th, who was followed to the grave on Saturday last by a detachment of that company. 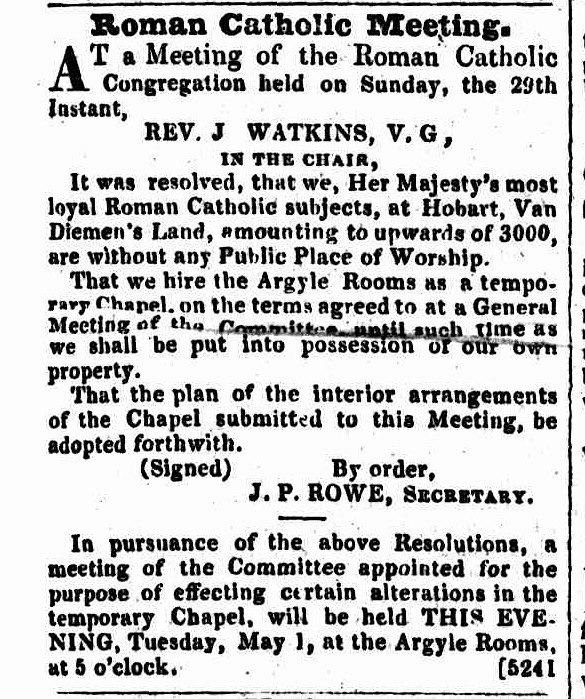 In the following decade (1830s), there was disagreemnt about who owned the chapel. I assume because it was built on land belong to Connolly rather than the Church. RESOLVED UNANIMOUSLY.–That it now becomes absolutely necessary to obtain from the Lieutenant Governor, a decision upon the important question, whether the Roman Catholic place of worship, and its appurtenances, are, like all others in the Christian world, the property of the Congregation, or the private property or the Revd. Mr. Connolly. There were also attempts to obtain sufficient funding from the government to enable the erection of a more permanent church. The Catholic population at the time was large but, being mostly convicts and ex-convicts, not very wealthy. 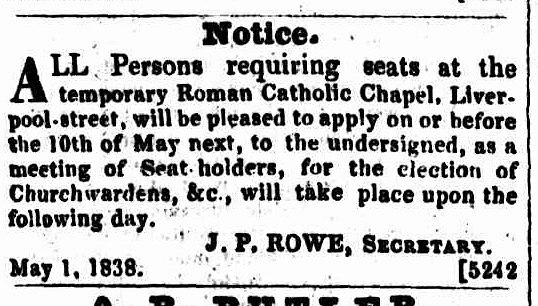 You are aware that the Roman Catholics of Hobart town have not, at present, any suitable place of public worship, whilst His Majesty’s government recently acquiesced in an increase of the number of chaplains–it has appeared to me, therefore, though I have no direct instructions from home upon the subject to be proper that aid should be given them in building a chapel sufficiently large to accommodate the congregation, and I have according proposed, that £1,500 should be voted for this purpose. It will be remembered, that a considerable number of the members of this communion are not in circumstances to afford much aid, and I should therefore submit, that this is a case in which an equal contribution by the people should not be rigidly required. In the meantime, temporary premises were used above the Argyle Rooms, on the corner of Liverpool and Argyle Steets. To the Editor of the Colonial Times. SIR,-I wish, through the medium of your widely circulated and independent Journal, to direct the attention of the proper authorities to a circumstance, of which, I must think, they cannot be cognizant. A License for a Public house has, I perceive, been granted to a suite of rooms, immediately under the apartment at present devoted to the purposes of a Roman Catholic Chapel. The glaring incongruity–to use no harsher term–of such a proceeding, needs no comment ; but it shows, in my humble opinion, a very great remissness on the part of those functionaries to whom is entrusted the granting of such licenses. Surely, they could not have been aware that this Temple of Mammon and Intemperance was in immediate contiguity with a place appropriated to the solemnities of Divine Worship;–that a place necessarily devoted to the orgies of Bacchus, was under the same roof as a Temple set apart for the worship and praise of God and the Saviour. The evil, however, I fear is now past remedy ; but I, as one of the humblest members of that church, which, I conceive to have been, by this act, insulted, shall never cease to impugn the conduct and solicitude of those who have committed and sanctioned the abomination. In your last number, you were somewhat fulsome in your praise of the present system of licensing publicans; and, I recollect, you passed an eulogium upon the existing licensed victuallers of this town as a body. I am quite willing to agree in the latter part of your praise ; but, I must take leave to tell you, that some very curious partiality was evinced on licensing day. To counteract this, Mr. Champ exhibited, on more than one occasion, a most virtuous and vehement objection to the licensing of too many houses in one neighbourhood. In the case, to which I have already alluded, at the Argyle Rooms, there are, within a stone’s throw of each other, eight public houses, six in Liverpool-street, and two in Argyle-street. Hobart Town, Sept. 10, 1838. On Thursday last, the first stone of the new Catholic Church; in Macquarie-street, was laid by the Vicar-General, the Reverend Mr. Therry, before a most respectable concourse of people. On Sunday the ceremony of laying the first stone of the New Catholic Church of St. Mary, on Mount Carmel, took place, between the hours of one and three; the stone had been deposited on the previous afternoon by the Rev. Mr. Therry, the Vicar General, but Sunday being the festival of the patroness Saint of the Church, the grand ceremony was re served for that day. A little before two o’clock the procession set off, from the temporary chapel in Liverpool-street, and proceeded along Elizabeth and Brisbane-street towards the appointed spot. The excellent Band of the 51st Regiment performing sacred music, preceded the procession, which was composed of the men of the ¿1st and 96th Regiments in Garrison, with Colonel Elliott, and the officers in full regimentals ; a number of boys, clad in white surplices, walking two and two, some bearing Censers with incense, others with wax tapars ; the children of the Catholic schools ; and a number of highly respectable towns-people, Catholics and others, the whole closed by the Rev. Messrs. Therry and Butler in full robes, forming a very imposing cavalcade. Arrived at the spot on Mount Carmel, the grand ceremony of Sanctification was performed by the Reverend Gentlemen above-named, assisted by the usual functionaries ; and, at the conclusion a subscription was collected, which amounted to a considerable sum,-upwards of £400 as we under stand. ‘The day was very fine, and a large concourse of spectators were assembled to witness the cere mony. This was somewhat of a surprise to the government, who weren’t keen on funding the construction of two churches. In June 1840, the Colonial Secretary received a communication from the rev gentleman, stating that he was about to proceed on the erection of two churches, one of St Mary and the second of St Joseph, which latter had never been heard of by the Government. For that purpose, stone was obtained from the government quarry, but on the same terms as it would have been sold to any private individual, without the possibility of that fact being construed into a tacit sanction on the part of the government. In September 1840, a petition was forwarded claiming assistance in the erection of churches for the N.E. and S.W. divisions of Hobart Town. Such might have been the ecclesiastical divisions bestowed by Mr Therry, but they were unknown to the local authorities. The assistance of convict labour was granted fur the completion of St Mary’s, which appeared somewhat called for, but refused for the second building. That relying on the good faith and honor of the Government, as pledged by that Act the petitioner commenced St. Joseph’s Church in Launceston, on the 19th March, 1839, St. Joseph’s Church in Macquarie-street, Hobart Town, on the 16th July, 1840, and the Church of St. Mary, Brisbane-street, Hobart Town, on the 21st November, 1841 ; that petitioner opened and celebrated Divine service in the Launceston church on the 8th instant, and in the Hobart Town church on the 25th of last December. St Joseph’s was completed, and is still in use. However the church of St Mary did not fare so well. The inauguration [of St Mary’s] took place on November 14, 1841, and the ceremonial (participated in by the 51st and 26th Regiments, under Colonel Elliott) was the most imposing that had then taken place in the island. Father Therry laid the foundation-stone. The building, however, was never completed, and in 1861 the walls erected by Father Therry finally disappeared. The erection of St. Mary’s Cathedral had engaged the attention of Bishop Willson throughout a great part of his episcopate. Mr. Roderic O’Connor had donated £10,000, £5,000 had been contributed from other sources, and on September 12, 1860, the foundation-stone was laid. Among those present upon that occasion were the Governor and Lady Fox Young, attended by Mr. N. Maule, A.D.C., and Major Douglas. The ceremony was an imposing one, and in the evening there was a Banquet at St. Peter’s-hall, in Collins-street, at which the Bishop presided, and among those present were Major Douglas, Mr. John Davies, M.H.A., Mr. Balfe, M.H.A., Mr. H. Hunter, and Mr. John O’Boyle. On the 4th July, 1866, Bishop Murphy having succeeded Bishop Willson, the dedication took place, the preacher being Dr. Shield the Bishop-elect of Adelaide. However, the new cathedral was short-lived. On the 28th May, 1876, St. Mary’s was closed to the public in order to allow of alterations and additions being made, which, after mature deliberation, were deemed absolutely necessary. Some diversity of opinion was at first expressed as to the advisableness of demolishing the lantern tower, the most conspicuous feature in the original design; but as stone after stone was removed, revealing the scandalous state of the masonry, the wisdom of the course adopted was admitted by all. New plans were prepared by Mr Hunter, differing in many respects from the original design furnished by Mr Wardell in 1860. The Cathedral as now completed provides all the space for both congregation and ceremonies (except the baptistry) combined in the entire plan of the building, the only portions remaining unfinished being the western front of the nave, the baptistry at the end of the south aisle, and the tower and spire at the west end of the north aisle. 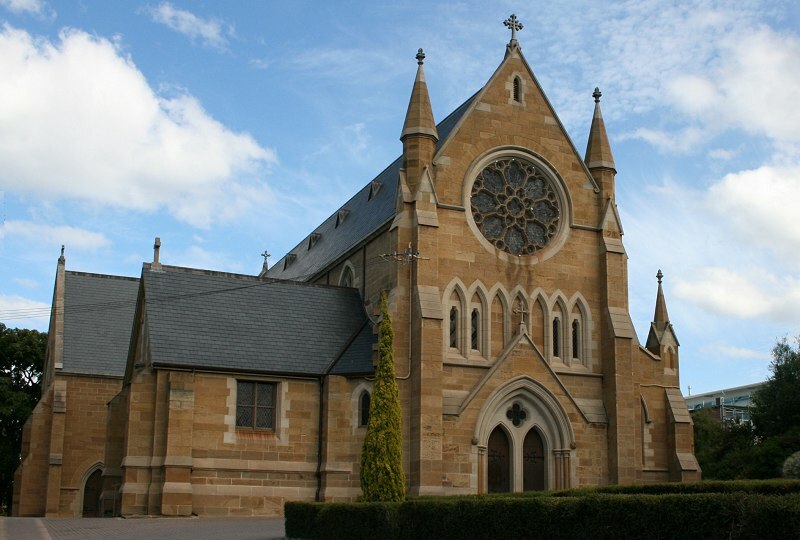 Five years later (1881), St Mary’s Cathedral was re-opened, and has remained in use since. RE-OPENING OF ST. MARY’S CATHEDRAL. The ceremonies connected with the re-opening and dedication of St. Mary’s (R.C.) Cathedral, Harrington-street, were performed yesterday with the elaboration and pomp with which the adherents of that Church are accustomed to surround their sacred mysteries. thank you so much for your research You have no idea how much time you have just saved me when I thought I was finished a UTAS assignment only to realise that St Joseph’s wasn’t built when my ancestors were married in 1834. You’re welcome! Always happy to hear when my work has been of use. It makes it worthwhile.